A friend once joked to my husband that his daughter was going through the “terrible twos,” despite being just a little older than one year. At the time, we both laughed and chalked it up to new fatherhood. Surely, those ear-piercing, drive-you-insane tantrums will not appear until a child is at least two or older. There is a lot of talk about the terrible twos and how hard that year can be, but you don’t hear much about the challenges of raising a one-year-old. Maybe it is because, compared with later years, one is not that bad, or maybe it just doesn’t have a catchy name. No matter the reason, the ones are a tough time in their on right. Parents, you have been warned. Don’t get me wrong, there are many wonderful things to look forward to as your infant moves, or, should I say, toddles into that next phase of life. You will watch in awe as he learns to walk. You will squeal with glee over the uttering of some sounds that could be actual words. Most of all, you will love how your once tiny little baby is quickly becoming a genuine human being. And, you will wonder how this adorable creature can be such a terror. I find myself thinking that every time my son has a fit when I won’t let him play with a dangerous item, or when I try to hold him still for a diaper change. I keep telling myself that now is the time to get his behavior under control, lest I want to be the mom with the five-year-old kicking and screaming in the middle of the toy store. I also understand that he is no longer a newborn, and he is much more deliberate in his actions. Still, it is hard to ignore the instinct to comfort your child. Sleep, for example, has always been a struggle. The past month has been especially tough. Teething, walking and separation anxiety have formed an ugly three-headed sleep-hating monster. Attempts to let self-soothe have been met with hours of crying and head banging, and not the good hair metal kind. I can only imagine his frustration and hope with increased vocabulary he will learn to express his anger in a healthy way. I think my mom calls that being a teenager. 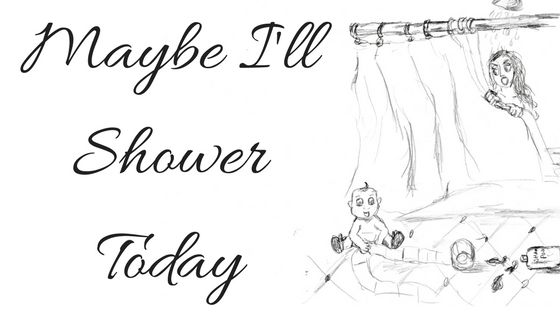 This entry was posted in Inspire, Smile on January 13, 2014 by Maybe I'll Shower Today.